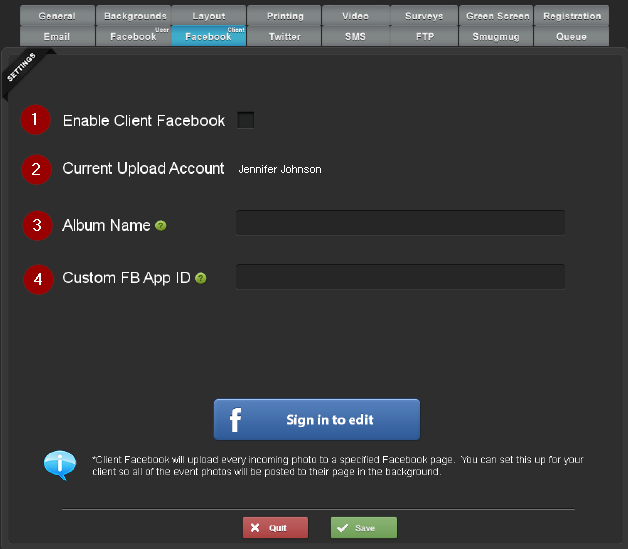 Check this to have all incoming photos automatically uploaded to a predefined Facebook page in the background. This can be a client page or your company page. You can have all of the photos uploaded to a specific album. This can be a preexisting album or a new album which Social Booth will create once you save the settings. By default, Social Booth will use its own FB app to upload the photos to Facebook. Users will see "Uploaded by Photo Booth Connected" on their walls. To change this to say the name of your company, you will need to set up you own Facebook app, and use the APP ID. You can also use a generic FB APP ID which will show up as "Photo Booth Uploader"